Have you ever tried to take your young kids to an art museum? Yeah, me neither – I think we all know how this story would end. One day they’ll be old enough to appreciate the great works of artistic masters but until then I think we’ll stick with iPad apps to boost their creative thinking and educate them on the art world. The Alice App: In this retelling of an age-old classic, Alice becomes interactive and the artwork (which took 4 years to create) is based on the Renaissance period. 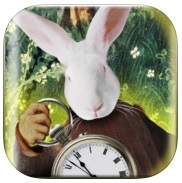 Besides text and stunning art, the storybook app boasts mind-bending puzzles and fun, engaging surprises on each page. 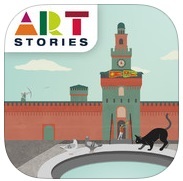 Art Stories Milan – The Sforza Castle: Take a virtual tour of the Milanese Sforza castle. Tour guides include 12 historical figures and Leonardo daVinci himself, with three modes and tons of interactive games and voice narration for non-reading players. Suggested age range starts at 7 but with some help, even younger kiddos will love this app. Musee du Louvre: Featuring over 150 famous pieces with expert commentary, this is one of my personal favorites. The official app of the French art museum brings globally recognized artwork right to your iPad (because that trip to Paris will have to wait a few years, oui?) 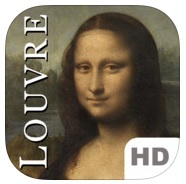 If you are taking a trip to France the app offers updated information on the museum’s special exhibits. 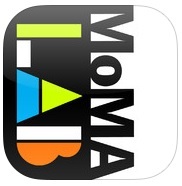 MoMA Art Lab: Not only does this official app offer kids insight to some amazing modern artwork it also enocurages kids to create their own art. Using different methods and techniques, players ages 7 and up can try their hand at impressionism or even make a sound composition. Art history is sprinkled throughout in a way that even school-aged kids can understand. 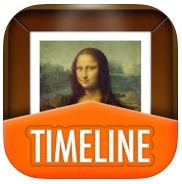 Timeline – Art Museum: Follow along in chronological order as this app details the works of prestigious artists like Botticelli, Klimt, and over 70 more artists that influenced art history in major ways. The app also has several language settings for multi-lingual learners as well as biographical information on all of the artists featured.